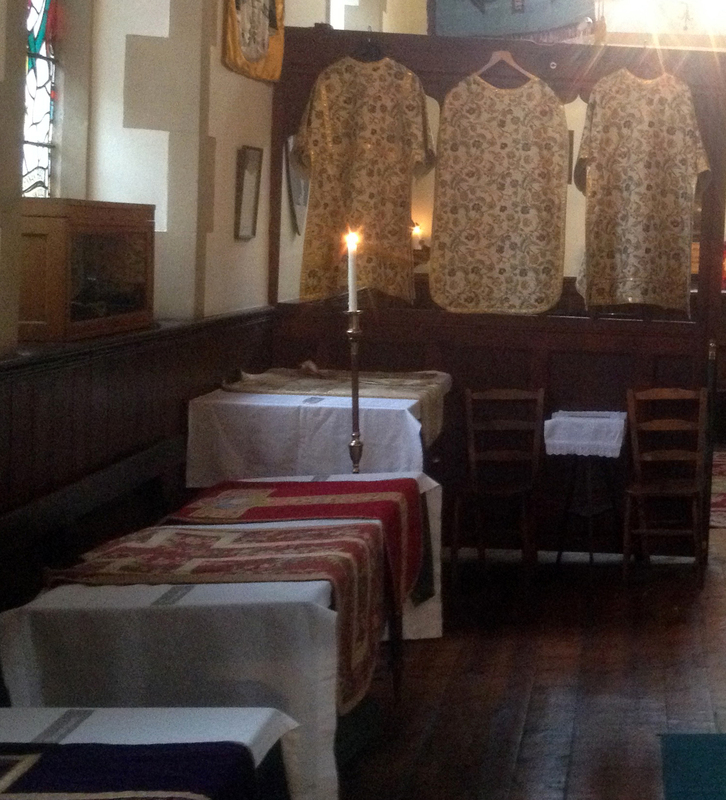 Our Vestments – St Vincent's Chapel, Edinburgh, the village church in the heart of the city. As the title informs, the vestments are associated with the Eucharist or Holy Communion for they are worn by a priest celebrating the Holy Mysteries. Their shape is a development of the outer cloak worn at the time of our Lord in the Roman Empire. Ponchos worn by women a few years ago give one a good idea of what an early chasuble, the long, sleeveless outer vestment, looked like. 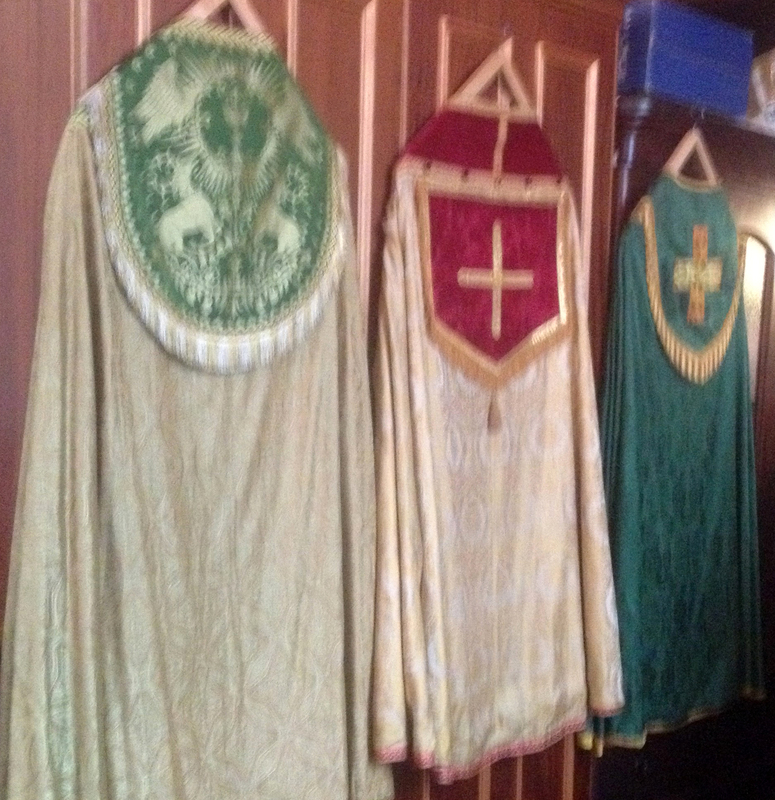 The vestment, as we know it today, has developed over 1500 years, not least the fabric used. We refer to those years as the Gothic period so these vestments are called Gothic. After the Reformation the Gothic style was replaced by the Roman or Latin style. When laid out flat one sees why it is often described as ‘fiddle back’. The Roman chasuble allows the skill of embroiderers to be appreciated. This new design was standard until the twentieth century. Since then the Gothic chasuble has experienced a universal revival. At St Vincent’s Chapel we have a complete set of both styles. In addition to the chasuble the stole is worn as a sign of priestly office. The maniple, an ornamental band, not often used today is a development of the towel worn over his arm by a waiter. You will notice the vestments differ in colours. This is a visual aid marking the seasons and important events in the Church’s calendar. Christmas, Epiphany, Easter, Ascension, All Saints, Lady Day, Candlemas and certain saints’ days, Corpus Christi. Mainly Christmas and feasts of Our Lord. Holy Spirit – Pentecost, confirmations, Saints martyred and Apostles. Penitence, Advent, Lent, Rogation-tide, funerals, Requiems, Ash Wednesday. Nature’s colour, Ordinary Sundays and weekdays. The longest period for green is from Pentecost to Advent Eve. Only twice a year, mid-Lent and Advent, two Sundays for a ‘breather’ during fasting in Lent (40 days) and four weeks of Advent. Funerals and Requiem Masses. Purple is often used instead and white stoles are standard too.